Nellie's Doxie Depot Reviewed by: Mariestrohm I highly recommend this breeder. I found both of my dachshunds on her website. I got two beautiful heathy puppies. Cell Doc Phone Repair Reviewed by: Joseph Cooney I just wanted to thank you Cell Doc team for the excellent job . My phone was completely smashed and Cell Doc wonderful team brought it back to my life! Good value, friendly, reliable, fast service! According to anthropologists, the area was occupied seasonally from about 5,000 B.C. by small bands of nomadic Native American tribes in search of food and game. The Lipan Apache moved into the area in the late 17th century and occupied it throughout the 18th century. However, the Lipan were forced from the area in the early 1820s by the Comanche Indians. A small farming and ranching community began to develop in the area shortly after the Texas Revolution in the late 1830s.The ranches suffered occasional attacks by the Comanches until the late 1870s. In 1858, a Scottish immigrant, Dr. George Marnoch, purchased the land that would later become the site of the town.Marnoch's home at one time served as a stagecoach stop and a post office for cowboys driving their cattle from Bandera to auction in San Antonio. His heirs sold a portion of their property in 1880 to a Swiss immigrant, Arnold Gugger, who built a home and mercantile store around which the town of Helotes sprang to life. In 1908, Gugger sold his property to Bert Hileman, who opened the town's first dance hall.He was also instrumental in getting old Bandera Road paved and opening the town's first filling station. He sold his property in downtown Helotes in 1919, when the town's population declined. 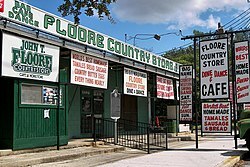 In 1946, the manager of San Antonio's Majestic Theatre, John T. Floore, opened the landmark John T. Floore Country Store, which is actually a dance hall (or honky tonk) that draws top country music talent includingWillie Nelson who still plays the venue on occasion. Mr. Floore also financed the first annual Helotes Cornyval festival in the 1960s, which was held to celebrate the opening of a new post office.Corn played an important role in the heritage of Helotes. The local Native Americans planted corn, actuallymaize, in the fertile valleys of the area, and feed corn was a major crop grown in the 19th and early 20th centuries. The town name is derived from the Spanish word elote, which can mean "ear of maize", "corncob", or simply "corn", but exactly how the town came to be called Helotes is still a subject of debate. As the urban sprawl of San Antonio expanded and approached the outskirts of Helotes in the 1970s, residents determined to take their fate into their own hands. After a decade of planning and negotiation, Helotes became an incorporated city in October 1981. To this day, residents still struggle with the dilemma of maintaining the city's rugged country charm, while at the same time allowing for the development of modern suburban facilities and businesses. Helotes was the hometown of the late Texas state Senator Frank L. Madla, who perished after his home on the south side of San Antonio caught fire on November 24, 2006.